When we visited the Kotobukiya Display at Toy Fair 2017, we saw multiple new Star Wars statues making their debut. 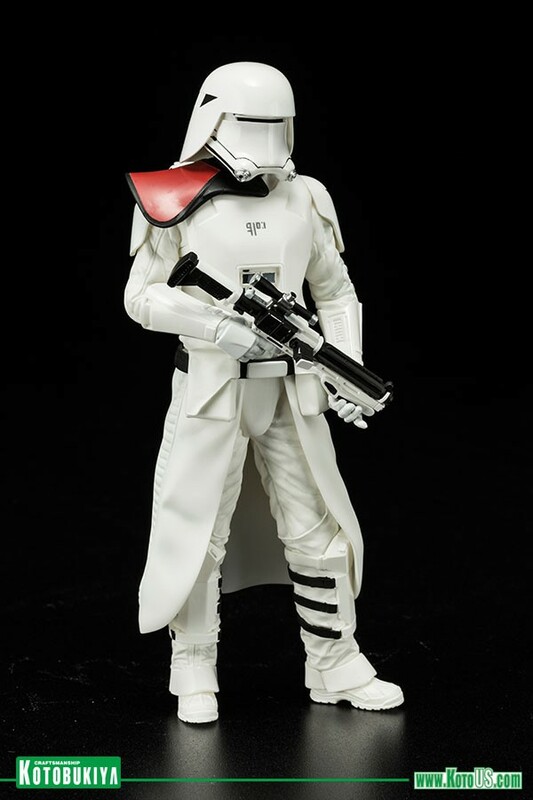 Among the new items was a Star Wars: The Force Awakens – Snowtrooper and Flametrooper ARTFX+ Statue 2-Pack. Each statue includes interchangeable parts for multiple ways to display them. A flame effects piece is also included. Kotobukiya has posted up pre-orders for the set, along with new photos and details. KOTOBUKIYA Japanese import! 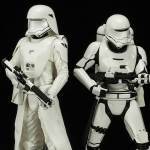 Star Wars ARTFX+ Statues bring you all of the quality and detailing that you expect from an ARTFX release in a great smaller scale perfect for collecting.The next elite army builder pack brings you more faceless characters from Star Wars Episode VII: The Force Awakens with the FIRST ORDER SNOWTROOPER & FLAMETROOPER TWO PACK! 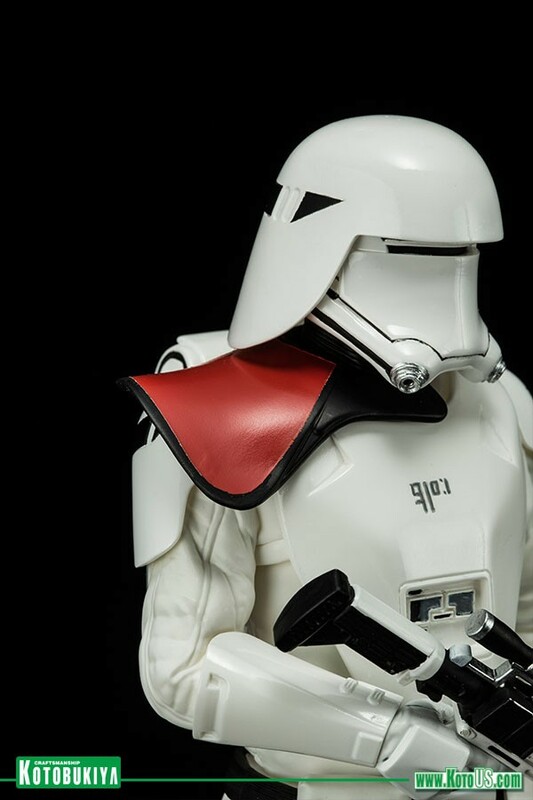 The war machine of the Imperial successor known as the First Order has several specialized stormtrooper variants, and these are two of the coolest and most popular with the fans. 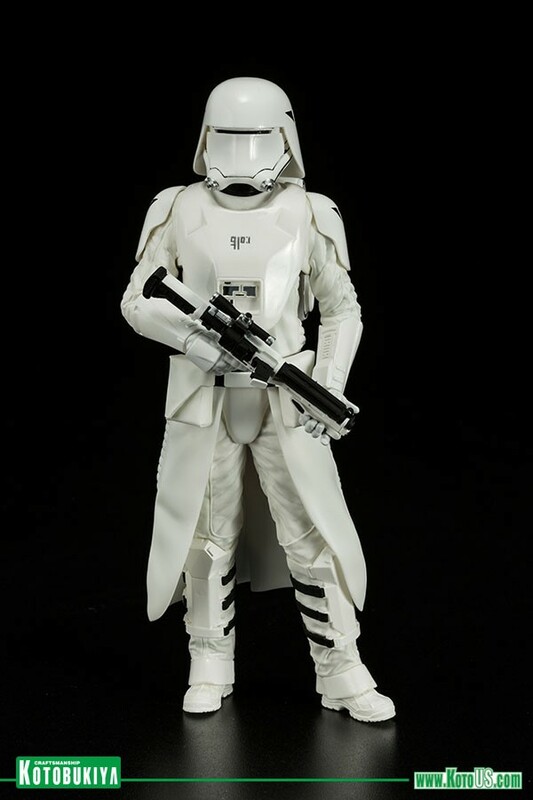 First up is the Snowtrooper with reinforced armor featuring thick gloves, bodysuit, kama, environmental backpack unit, and of course a distinctive helmet with glare-reducing eye slit. 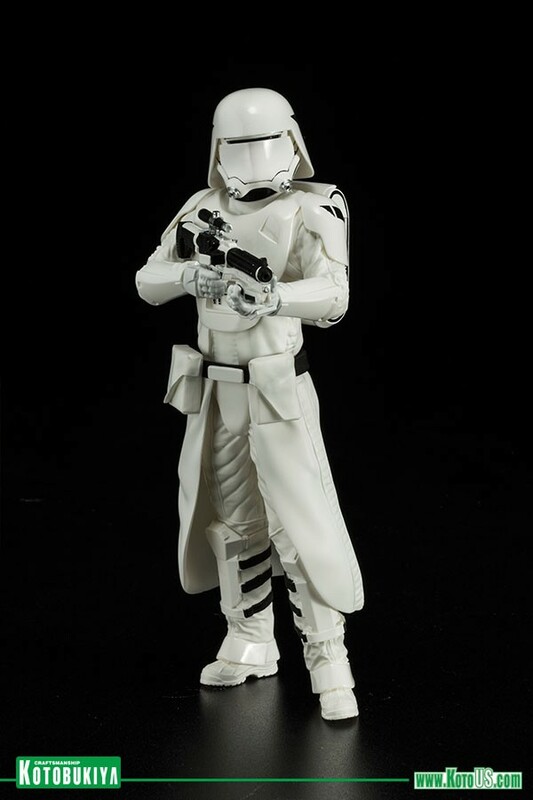 This Snowtrooper can be posed aiming his blaster or holding it at rest, and he comes with an optional red shoulder pauldron to denote rank. 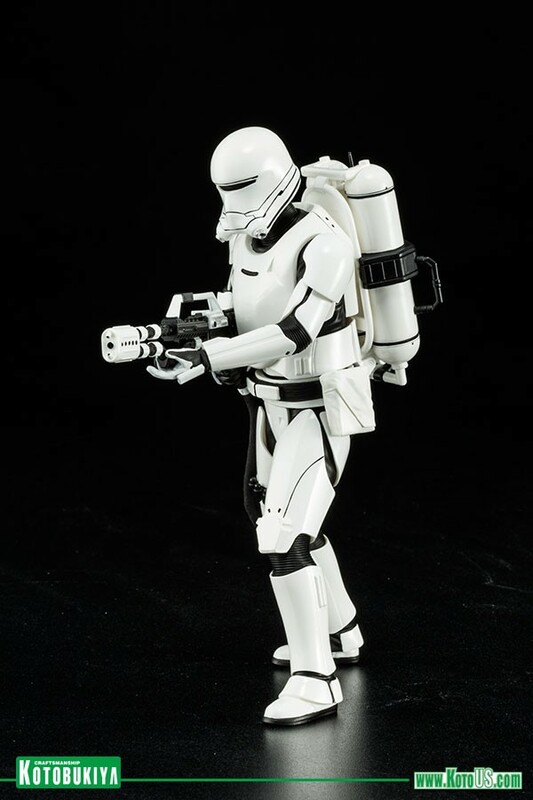 At the cold weather trooper’s side in this two pack is the Flametrooper, a highly trained soldier wielding a fearsome anti-personnel weapon. 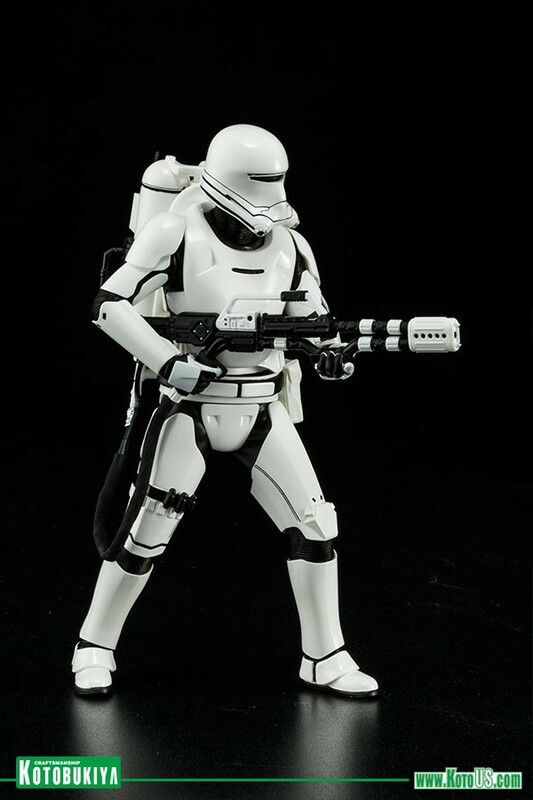 Like his Snowtrooper ally this First Order warrior wears armor with enhanced environmental features including another helmet designed to mitigate glare (this time from sheets of flame), but trades in the blaster for a powerful D-93 incinerator weapon tied to a backpack loaded with propellant tanks. 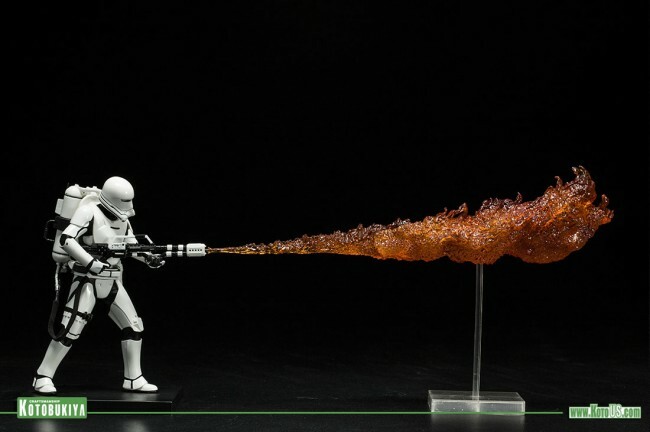 Kotobukiya even supplies your Flametrooper with a special freestanding flame jet special effect part for a dynamic action display! ARTFX+ Statues are fun-to-assemble pre-painted snap-fit kits that can be put together easily in seconds without glue or modeling skill. 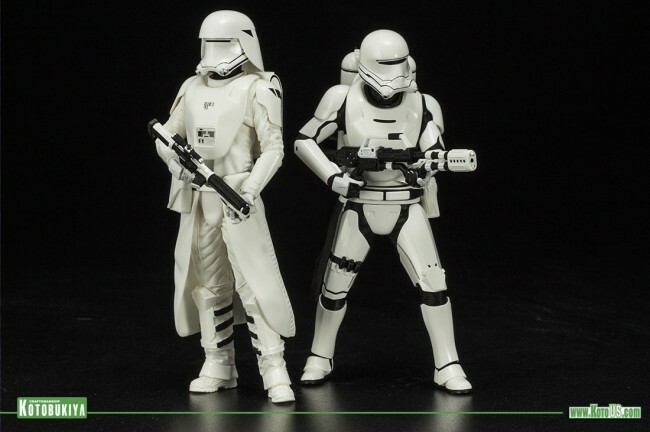 The Snowtrooper and Flametrooper in this two pack stand just over and under 7 inches tall (1/10th scale) in their respective aiming and firing poses, and magnets in their feet provide perfect stability on the included metal display bases. 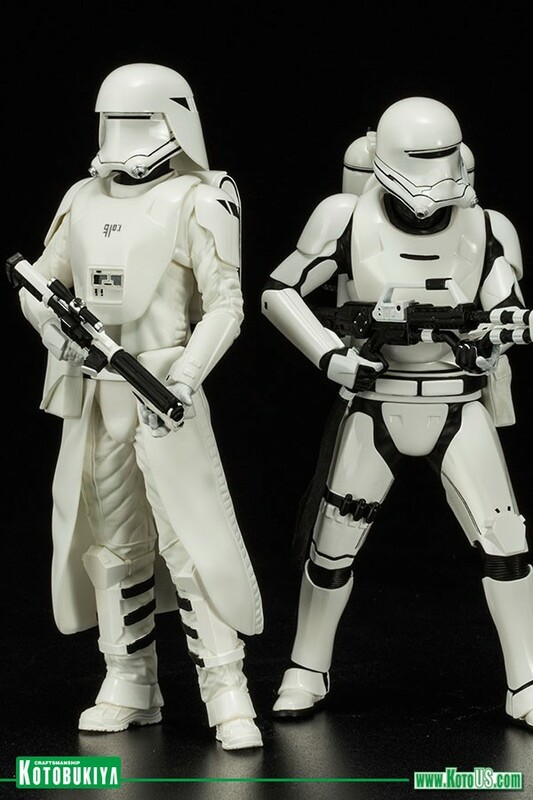 Your First Order collection will root out its enemies no matter what the environment with these two elite troopers at your command! The set is priced at $149.99. A release is scheduled for August. see the photos after the jump.